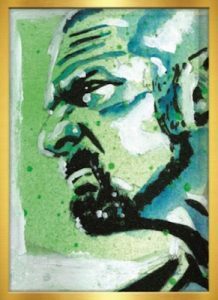 2019 Topps WWE Transcendent Collection - Wrestling Card Checklist	Overall rating:	4	out of 5 based on 1	reviews. 2019 Topps WWE Transcendent Collection takes the ultra high-end release from the MLB over to the world of professional wrestling. As probably the most expensive wrestling card release in history, the product must offer a lot in order to draw collectors in. 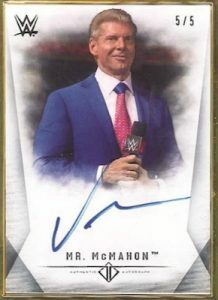 The release includes no less than 50 hard signed autographs, including the first ever official Vince McMahon signed card. It also offers an autographed replica title belt, cut signatures, and a ticket to Wrestlemania 35, along with a VIP meet and greet with WWE superstars prior to the event. Each box also includes a hand drawn sketch autographed by artist Rob Schamberger. 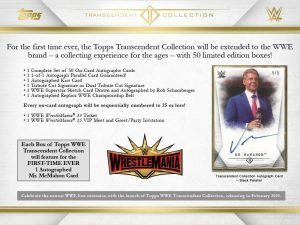 A box of 2019 Topps WWE Transcendent Collection will set buyers back about $13,000USD.